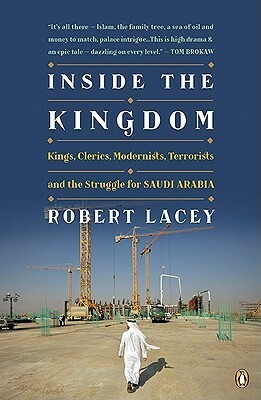 Inside the Kingdom: Kings, Clerics, Modernists, Terrorists and the Struggle for Saudi Arabia, Robert Lacey, Penguin Books, 2009, ISBN 9780670021185, 432pp. My wife and I are about to begin an assignment in Saudi Arabia that will have us living there for months or possibly years, thus my need to quickly increase my knowledge about the Kingdom and its culture. This book by Robert Lacey is actually a follow-up to a much larger volume titled simply, The Kingdom, that Lacey first published in 1981. This, basicaly, is a sequel, but one written with the purpose of understanding the events that occurred after 1981 related to Saudi Arabia, specifically the war in Afghanistan, the rise of Al-Qaeda, 9/11, the embassy attacks within Saudi Arabia, and Guantanamo Bay. 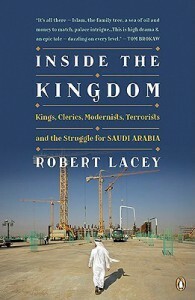 The title, therefore, is both accurate and inaccurate: if anything, Lacey’s premise is that the last 30 years has forced Saudi Arabia to come to the realization that the Kingdom affects and can be affected by events outside its borders, for better or worse, and can no longer be denied by the King. It’s a fascinating book, and Lacey an engaging and smooth writer. Things I was able to learn from the narrative include finally understanding some of Saudi Arabia’s attitude towards its neighbors (as well as sections of its own population) by Lacey’s clear explanation of the Sunni and Shia differences. The book also illustrates the strange shift in Saudi attitudes towards hardline Muslim extremists and business-focused Westerners by focusing on several of the important power brokers in addition to the Al-Saud family. The book was published in 2009, but based on what I’ve already learned from my first trip to the country, is in need of a couple of additional chapters, as Saudi Arabia continues to both embrace and fight a rapid pace of change. Just in the last year, a university dedicated to women’s education has been completed near the Riyadh airport and several economic cities dedicated to trade, banking, and manufacturing are due to be completed in the next year. Women continue to press for more rights (not just the right to drive, but with regards to family and property rights) and the religious police have recently been pulled back from some more egrigious behavior. All of these are on a pendulum, one that Inside the Kingdom reveals can just as easily swing back in a more conservative direction. It’s going to be an interesting time here.